(Verso) on mount, inscribed "Collection Lord Charles Townsend" in black chalk. 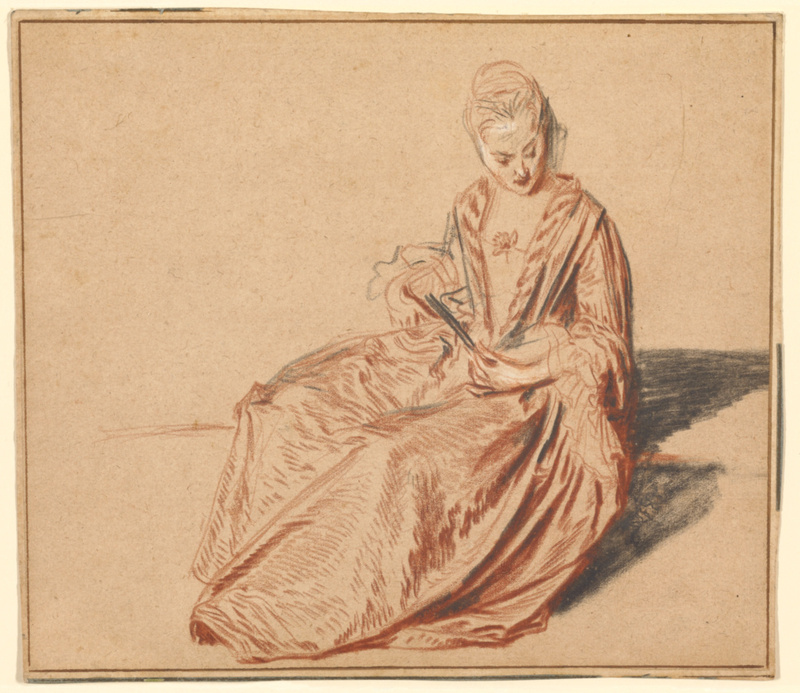 Using a delicate pattern of red chalk lines to illustrate the play of light on the folds of the woman's silk dress, Jean-Antoine Watteau portrayed an elegant young woman in an unself-conscious pose. Black chalk strokes accentuate elements of emphasis: the closed fan in her hands, the outline of the edges of her dress, and the deep shadow behind her. White lines add areas of highlights. Watteau particularly favored the effects of combining three colors of chalk, red, black and white, a technique known as trois crayons. Watteau probably sketched the figure as a life study, not in preparation for a particular painting. Later, when he required a particular gesture or movement for one of his paintings, he would have referred back to this drawing. The breathtaking simplicity and elegance of this sketch display his virtuosity and inventiveness; others said that even Watteau preferred his drawings to his paintings. Wildenstein & Co. (New York) (New York, New York), sold to the J. Paul Getty Museum, 1982.